Autograph Letter Signed ('Saml Roberts') from the philanthropist and abolitionist Samuel Roberts of Park Grange, Sheffield, to the poet James Montgomery. Park Grange, Sheffield, Yorkshire; 20 April 1837. 3pp., 4to. Bifolium. Good, on lightly-aged paper. Addressed, with broken seal in black wax, on verso of second leaf, to 'James Montgomery Esqr'. 80 lines of text. He has been twice that day to Montgomery's Sheffield mansion the Mount 'to enquire about you - the first time in vain, and the second nearly so. There they are much as heretofore - but Miss Sarah meaning to write sermons you may have it before this.' Roberts declares: 'I think the present great Lions of the town are myself and mad dogs - perhaps you may think that they might be included under one head - yes - if that head was yours! 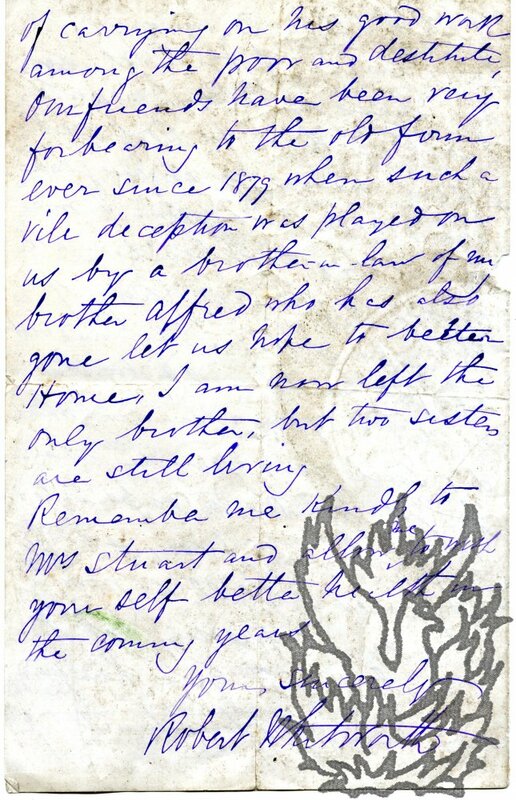 Autograph Letter Signed ('Saml Gurney'), addressed to a 'Respected Friend'. 12mo, 2 pp. On grey paper. Fourteen lines. Text clear and complete. Lightly aged, and with numerous crease lines from folding. An eloquent letter declining to donate to an educational charity. He has 'large opportunity of giving as much of my funds in that direction as I am desirous of doing'. He confines himself to supporting the British and Foreign School Society. He suggests a renewed application regarding 'those likely to be established in my neighbourhood'. 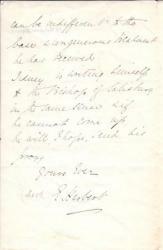 Autograph Letter Signed to John William Stuart, on the occasion of his brother Benjamin Whitworth's death. 2 October 1893. 14 Brown Street, Manchester. 8vo, 4 pp. Bifolium. Sixty-eight lines of text. Complete and legible, but damaged: grubby and creased, with short closed tears and small hole at gutter. Interesting and informative letter. Stuart's message of condolence on Benjamin Whitworth's death is one of many which 'have been very acceptable more especially to his widow who has been laid aside so long with bad health, his daughters have been quite worn out'. Describes how his brother's health 'began to break down after a slight attack of paralysis some two or three years ago when at John Brown & Co Ld. Autograph Letter Signed ('Thos. Wright') to a female 'Christian friend'. Sidney Street, C on M, Manchester; 25 June 1863. Three pages, 12mo. A tad aged, with some discoloration and a little glue from previous mounting to the blank verso of the second leaf of the bifolium. He was 'from home' when the note arrived, only returning on Tuesday. 'It will give me great pleasure to be with you on the day when the Foundation Stone will be your School. Sends 'every blessing' to the recipient and her 'Xcellent husband'. A life of Wright was published in 1873, with a preface by the Earl of Shaftesbury. Letter <in secretarial hand?>, signed in autograph, to 'Mr <Dubarry?>. 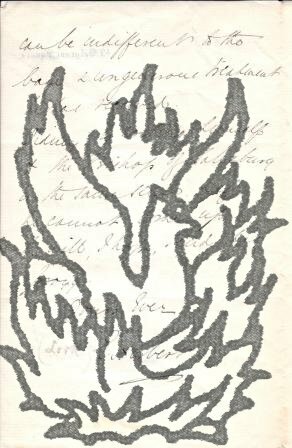 27 April 1889; on letterhead '12, GAYTON CRESCENT, | HAMPSTEAD'. English novelist (1836-1901). Two pages, octavo. Some discoloration in margin from previous mounting. His silence is due to the fact that he has been 'out of town for Easter'. He is grateful to his correspondent for thinking of him 'in connection with the Garrick. But I am afraid I must not consider it. You see by the address that I live out of the way of clubs - This is for the sake of certain small children <?> to be considered'. He is already a member of three clubs: the Athenaeum, the Old University and the Savile ('wh: I do frequent'). 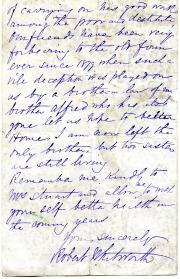 Typed Letter with cyclostyle signature to A. D. Snow of St Leonards-on-Sea. Quaker confectioner, social reformer and philanthropist (1839-1922). 1 page, 8vo. A little grubby and creased but in good condition overall, with the blank reverse attached to remains of another piece of paper. He thanks his correspondent for his letter and states that 'The Friends' Meeting House at Stirchley has been used for very many years by the Friendly Societies instead of the liquor shop. I believe that one society of 700 members [manuscript addition: 'the largest branch in the Midlands'] and another of 400 members have payments made in one of the rooms connected with it.